Last year, I bought a collection of ebooks as a bit of an impulse buy. A blogger I admire was promoting the product—Ultimate Bundles—and I couldn't help but spend less than $30 on a bunch of healthy living ebooks that I couldn't have possibly purchased individually. There were also some freebies included in the purchase price, and I began to wonder if there was some sort of a catch somewhere. Indeed, there was not. And I am still, one year later—especially with the help of our new hand-me-down iPad and the handy-dandy Kindle app—going through the awesome resources within the bundle. Have I piqued your curiosity? Read on, my friends. This Healthy Living Bundle includes 73 ebooks, 7 audio eCourses and $200 worth of bonuses. The price is only $29.97 (PDF version—which I have, and works perfectly fine on our iPad) or $39.97 (eReader version), with a total combined value of $1,030. The price is right for any of you thrifty ladies or gents…I know that's what sold me on buying it myself last year! 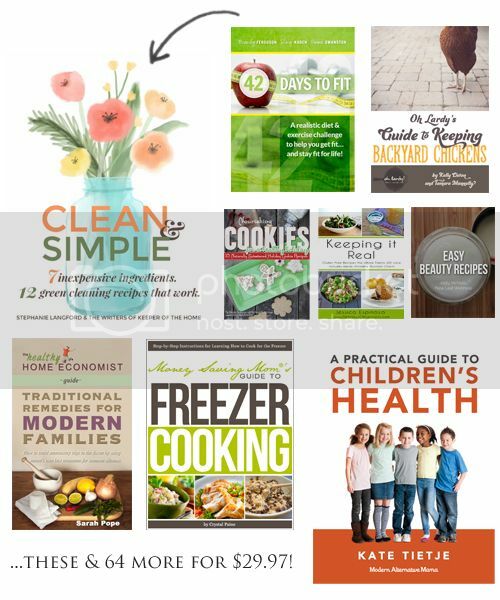 This bundle includes resources on green cleaning, healthy eating, natural skincare, fitness, cooking with "real" food, home remedies, gardening, cooking for special diets (gluten-free, allergy-free, etc. ), and many more. For a peek at all the ebooks included in this offer, click here. Where? Purchase the bundle right over here! How much? The entire package is worth $1030, and it’s selling for less than $30. Not too shabby! To see exactly what’s included in this bundle, head on over to the website, where you can see the full list of ebooks, eCourses, and bonus offers. What if I'm not completely happy as a clam? That's okay. Ultimate Bundles offers a one-year guarantee: you have a full year to enjoy all the books and courses in the bundle, and if you don't feel it's made a huge difference to your family's healthy, you'll get your money back in full! How many are available? There are only 30,000 bundles available and once they're gone, they're gone! These bundles have been so successful in the past, there is a chance they will sell out before the sale is over, so be sure to buy before you miss out. When it comes down to it, odds are you won't be interested in 100% of the ebooks within this bundle. (I included a book on raising backyard chickens in the cover collage at the top of this post because it made me giggle, but also because I'd totally be that person with a chicken coop in our back yard…if we actually had a yard.) I figure even if you can pinpoint 25 books from the list that you would have been interested in reading, you'll still get more than your money's worth. I'm recommending this bundle because I think it is a fantastic deal and I've been so pleased with my own purchase. If you'd like to buy your own bundle, clickity-click below! Affiliate links are included in this post. I receive a commission on each bundle sold through my personal links. (Thank you for supporting me with your purchase!) Read the fine print about this bundle and read the answers to frequently asked questions about the bundle!